Healthy cooking has never been my forte. I am capable of eating a pat of butter with no bread. I’ll lick the mayonnaise spoon. If I fry bacon, I’m saving that precious fat to cook asparagus later. To me, ground turkey meat is a bizarre health food invention — a tasteless pink goop that cooks up to the texture of styrofoam. The only way I know how to make this paltry poultry bearable is by masking its shortcomings with tons of fresh herbs and fish sauce (umami!). I can’t figure out where we found this recipe originally, but I believe it was called “Thai Turkey Burgers” due to the combination of basil, cilantro and fish sauce. We ended up adding mint along the way to punch things up further. It’s like a patty version of laab/larb, a Thai dish where ground meat is served in lettuce cups. 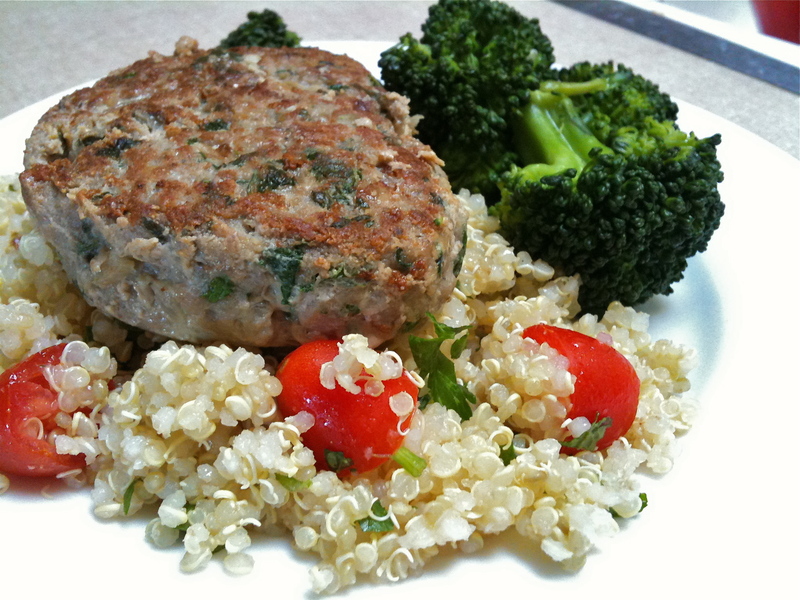 I like eating these Thai Turkey Burgers over a bed of quinoa salad, but they’d be equally great on a traditional hamburger bun with all the fixings. Don’t forget the mayo! Place turkey in large mixing bowl; add onions, cilantro, basil, mint, garlic, fish sauce and egg. Mix with your hands until just combined — do not over mix. Scoop 1/3 cup of turkey mixture and form a ball by passing back and forth lightly in your hands. Set aside and repeat with remainder of mixture. Should make around 10 miniature patties, around 3″ in diameter once flattened. Heat a skillet over medium heat; add enough vegetable oil to coat bottom of pan. Add meat balls to pan and flatten into patties by pressing lightly with your fingers. Cook for around 4-5 minutes on each side taking care to flip and adjust heat when first side is browned. Cook in batches, if not all fit in your pan at once. Serves 3-4. For Christmas, LeeMa gave me David Chang’s Momofuku cookbook. Every time I’m in New York, I aim to hit up at least one of his famous mod Asian joints — typically a late night stop at Milk Bar for a slice of Crack Pie. The cookbook reads like a biography of David Chang with wonderful anecdotes about studying ramen in Japan and trying times he faced in opening his restaurants. As for the recipes, many are focused on technique — for instance, I am not about to make my own ramen noodles. Others are about wacky flavor combinations that just make sense — the stink of brussels sprouts and the funk of kimchi, it’s a match made in heaven! Saute bacon over medium heat in an oven-proof skillet, until just crisp (around 5 minutes). Transfer to paper towel-lined plate. Drain off most of the fat and add brussels sprouts to skillet. Flip so sprouts are all cut-side down. Raise heat to medium-high and sear until sprouts start sizzling. Put skillet into the oven and roast until deeply browned, around 8 minutes. Shake pan to loosen sprouts, then put back in oven for 10-15 minutes more. Sprouts are done when they are bright green and tender. Return skillet to stove top on medium heat; stir in butter and bacon. Season with salt and peper; toss to coat. 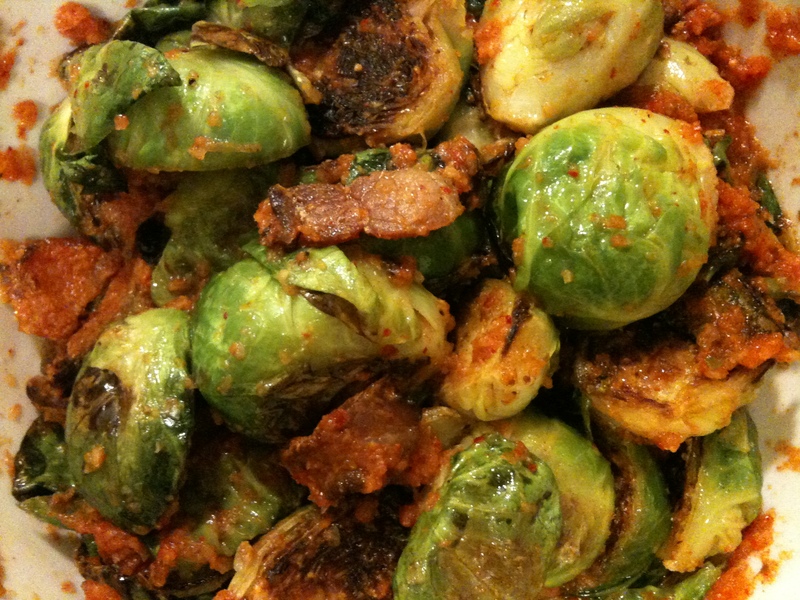 Divide pureed kimchi among four bowl and top with sprouts. Garnish with carrot. Serves 4 as a side dish. I don’t know how many times I’ve accidentally given a lecture about quinoa. First off, no one seems to know how to pronounce it properly. No, it’s not QUEE-NO-AH, it’s more like KI-NWA. After that, I tend to launch into quinoa’s historic context as the “mother of all grains,” how it was the sacred food of the Incas, and the fact that it provides all of the essential amino acids of a complete protein. Yes, it can have that crunchy texture, but if you cook it properly with lots of flavors, it can serve as the base for a hearty vegetarian main course, or refreshing grain salad similar to tabouleh. 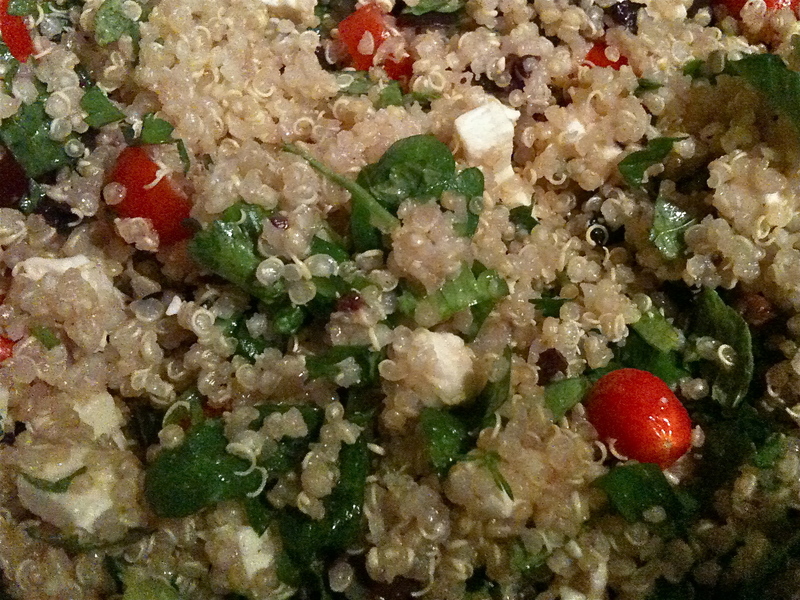 Here are two of my favorite ways to cook quinoa. Bring 2 cups of chicken broth to boil in medium saucepan. Add quinoa, reduce heat to medium-low, cover, and simmer until tender and water is absorbed, about 13 minutes. If there is left over water, drain it off. Meanwhile, heat oil in large skillet over medium-high heat. Add onion and sauté until onion begins to brown, 5 minutes. Add garlic; stir 30 seconds. Add mushrooms and thyme. Saute until mushrooms are tender, 6 minutes. Toss in bell peppers; sauté for another minute or so. Add wine; stir until wine is reduced and liquid is syrupy, 2 minutes. 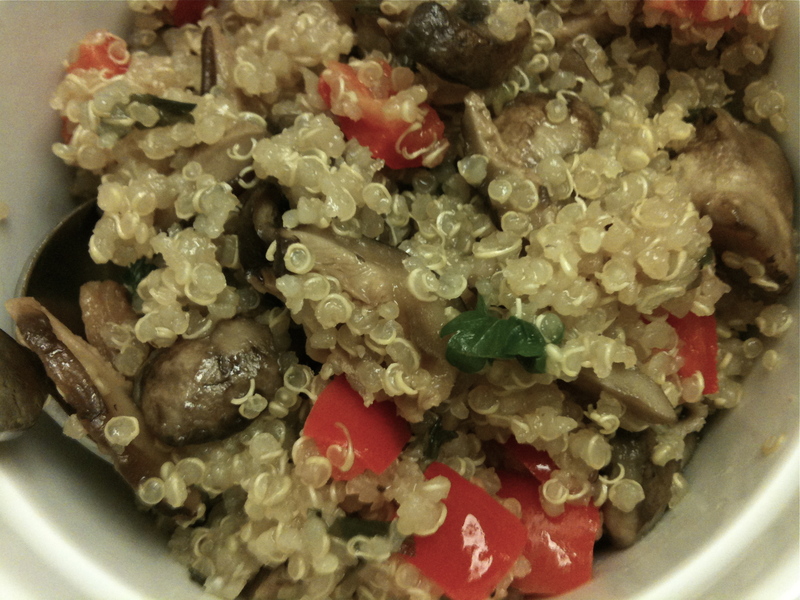 Mix quinoa into mushroom mixture and add parsley; season with salt and pepper. Pass cheese separately. Serves 4 as a main dish. Bring 2 cups of salted water to boil in medium saucepan. Add quinoa, reduce heat to medium-low, cover, and simmer until tender and water is absorbed, about 13 minutes. If there is left over water, drain it off. Cook quinoa in a medium mixing bowl. Once quinoa has cooled to room temperature, add the rest of the ingredients. Toss with the dressing — no need to mix the oil and lemon juice together first. Taste and add more oil and lemon juice accordingly. Season with salt and pepper. Serve immediately or chill for a few hours to let the flavors develop. Serves 6 as a side dish. Oh no you didn’t! Oh yes, I did. Bacon in the batter. Bacon in the frosting. Bacon garnish… I’m such a pig. I blame January’s issue of Food & Wine for my renewed obsession with bacon. According to their keenly calculated trend predictions, breakfast foods are set to make a huge comeback in 2011, especially my dear friend bacon. Last month was J’s birthday. Like myself, J doesn’t care much for sweets, so I immediately began brainstorming savory desserts. Something nutty? Cheese-y? Meaty? Mmmmmyes. Coffee, rich Scharffen Berger cocoa, buttermilk, and a whole pound of bacon… it’s the stuff birthday dreams are made of. Moist dark chocolate cake (healthily embedded with bacon bits) meets “baconcream” frosting and a crispy strip of the good stuff. 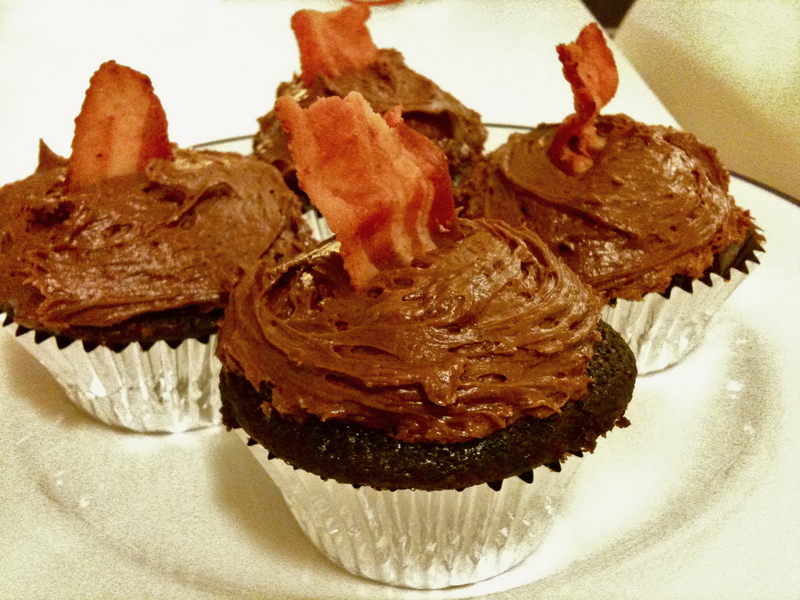 Hello, bacon cupcakes! Preheat oven to 375 degrees. Place bacon in a large, deep skillet. Cook over medium-high heat until evenly brown. Reserve bacon fat for frosting, drain bacon on paper towels, crumble 3/4 of the bacon strips and set aside. In a large bowl, stir together the flour, 3/4 cup cocoa powder, sugar, baking soda, baking powder and salt. Make a well in the center and pour in the eggs, coffee, buttermilk and oil. Stir just until blended. Mix in bacon bits, reserving the rest for garnish. Spoon the batter into the prepared cups, dividing evenly. Bake in the preheated oven until the tops spring back when lightly pressed, 20 to 25 minutes. Cool in the pan set over a wire rack. Prepare frosting: In a medium bowl, sift together the confectioners’ sugar and cocoa, and set aside. In a large bowl, cream butter and bacon fat until smooth, then gradually beat in sugar mixture alternately with evaporated milk. Blend in vanilla. Beat until light and fluffy. If necessary, adjust consistency with more milk or sugar. Frost cupcakes generously and decorate with reserved bacon strips. Makes 24 cupcakes.